MIAMI COUNTY — As the new superintendent of the Miami County Educational Service Center, David Larson hopes to use his experience in different local school districts to serve the county’s schools and students. David Larson, who previously served as the center’s director of curriculum and instruction, took on the new role this summer. He succeeded Tom Dunn, who retired after eight years with the center and a long career in local public education. Larson said he considers Dunn one of his mentors and added that their philosophies are very similar when it comes to education. Larson and his wife, Covington residents and high school sweethearts, attended Bowling Green State University and came back to the county to live and teach. He began his career in education at Tippecanoe Middle School in Tipp City, where he taught and coached for five years before taking a job as a principal in Russia, Ohio. In 2009, Larson was hired as a middle school principal in his hometown of Covington and after two years, was hired as the district’s superintendent. Though his wife, Rachel, teaches in Covington schools now, the couple never worked in the district at the same time. When he worked in Covington, she was home with their two young children, he said. He took an assistant superintendent job in Piqua in 2014. While he was working in Piqua schools, Dunn contacted him to tell him about a new job at the ESC. Larson worked as the director of curriculum and instruction for about two years, and called it a “great opportunity and great job.” He worked closely with Covington schools to develop their curriculum. He also worked with all the resident educators, teachers in their first four years of teaching, in Miami County. Last year, he also worked with the ESC in Montgomery County. 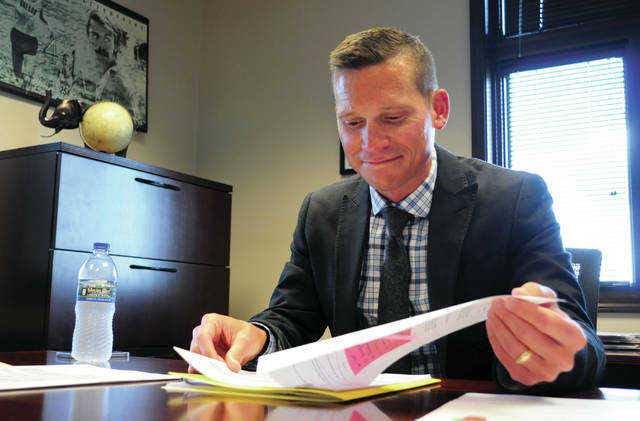 Larson was offered the superintendent position in the spring and began a “strategic” transition into the new role. For about five months, he worked closely with Dunn, attending his meetings and learning the ropes, he said. The Miami County ESC was established in 1914 to support the county’s schools and now employs more than 300 people. Its services include a resident educator program, curriculum development, special education and preschool classes, and professional development. “I don’t think most people know how much we do,” he said. Working in different Miami County districts has helped him prepare for the new role, Larson said. “One of the things that helped me prepare for the job more than anything, is that I worked in Covington and in Piqua. So I got to see how a small school district interacts and works with the ESC and what their needs are, but I also got to see what one of our larger districts in the county needs and wants from the ESC,” he said. Larson said the ESC is “such a unique place to work” because the center has to balance the needs and interests of a local school district with ensuring that the ESC is offering the highest quality programming. One of Larson’s goals for the center is to solidify its vision and beliefs, he said. Larson and his wife and their two young daughters live in Covington, where she teaches and the girls attend school. Larson is also a distance runner and runs in races when he has the chance. He’s also active in his church, St. John’s Lutheran in Covington, where he leads a monthly breakfast club for teens.